If someone you know within the Richard Bland community has experienced sexual misconduct, we can help you help them. Sometimes, the most valuable advice comes from someone the individual already trusts. Whether you’re a friend, roommate, parent, or concerned member of our faculty or staff, we can point you to resources that you can share, as well as provide support for you through the process. Confirm the person’s safety. Ask the survivor, “Are you safe right now?” If they say no, help them create a plan to get to a safe place. If necessary, call Campus Emergency Services at 804-862-6111. Provide nonjudgmental support. Your role is not to determine whether or not something occurred. Your primary responsibility is to remain supportive of the survivor, while referring the person to others who are trained in providing assistance and/or intervening. Help the person consider whether to file a report with the police or with the College. Direct the person to on-campus and off-campus confidential counselling and advocacy resources. Let the person know who at Richard Bland they can contact to request protective measures and accommodations such as no-contact directives, housing relocation, adjustment of schedules, time off, etc. 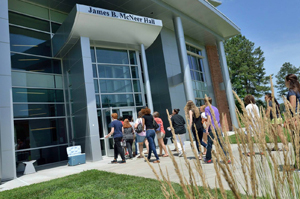 All Richard Bland employees, including student employees, are required to report incidents of sexual misconduct, unless they are confidential resources. If you are required to report the incident, explain your reporting responsibilities to the person who has disclosed the information to you. While you are not expected to act as a counselor, when you are with someone who has experienced sexual misconduct, you should be aware that the supportiveness of your response can be critical in the healing process. Though there is no one “right” way to respond, the following may serve as a guide identifying more or less helpful responses. Give the survivor your complete attention. To share more or be silent. To call referral agencies or not, or to have you call. Ask the survivor what they need. Remind the survivor that they are not alone, that other people of all genders have experienced sexual misconduct. Provide the survivor with information about the resources available to them, including confidential counseling, medical resources and reporting resources. Follow up with the survivor. Report the incident to the Title IX Coordinator if you are a College employee. Take care of yourself after dealing with the situation. Get support for yourself if you need it. Consider speaking with a confidential counselor. Tell the survivor that you know what they are going through. Label the experience for the survivor or make any legal conclusions. Tell the survivor what they should do or make decisions for them. Question whether the survivor is telling the truth or show doubt about their story. Tell the survivor that they need some proof or evidence. Touch the survivor’s leg, shoulder, hand, etc. unless they have explicitly told you that it is okay to do so. Talk about your own issues or history. Guarantee complete confidentiality, particularly if you are a University employee with a reporting obligation. Panic. Take a deep breath and focus on listening to the survivor.